In a landmark verdict that could affect numerous other cases, a federal jury in San Francisco found Roundup herbicide to be a significant contributing factor in causing the cancer of a man from Santa Rosa, California. During the trial, 70-year-old Edwin Hardeman (see featured image) alleged that his decades-long exposure to the Monsanto product had led him to develop a cancer that affects the immune system, called non-Hodgkin’s lymphoma (NHL). 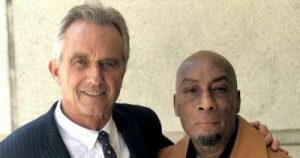 Tuesday’s ruling follows another pivotal verdict against Monsanto in August, where the jury awarded terminal cancer patient Dewayne Johnson (pictured with his lawyer Robert F. Kennedy Jr) a staggering $289 million in damages after ruling that the biotechnology corporation failed to properly warn users of Roundup’s health hazards. New .gov Report: 1 in 40 Kids Has Autism – Where is the Panic?